Thàinig dà là de chòmhraidhean eadar CalMac agus aonadh an RMT gu ceann gun aonta mu phàigheadh. Thuirt an RMT gun do dh'fhailich air CalMac tairgse reusanta a chur air adhart. Tha an t-aonadh ag ràdh gu bheil a' chùis a-nis aig ìre eas-aonta foirmeil. Nì buidheann riaghlaidh an RMT co-dhùnadh a-nis air dè an ath-cheum a ghabhas iad. Thuirt an t-aonadh gun do dh'innis CalMac dhaibh gun robh an tairsge aca airson cùmhnant seirbheisean aiseig a' chosta an iar stèidhichte air Clàr Phrìsean Reic, an CPI, agus on a seo a-mach gum biodh tairgsean-pàighidh sam bith stèidhichte air a' chlàr sin seach Clàr Phrìsean Luchd-ceannaich, an RPI, mar a chleachd. A bharrachd air a sin tha an RMT ag ràdh nach bi CalMac a' pàigheadh bònas de 1.5% dhan luchd-obrach tuilleadh ma nì a' chompanaidh prothaid. 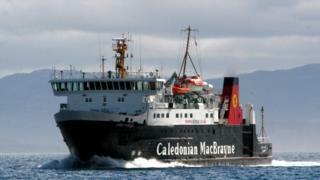 Tha CalMac air a bhith a' pàigheadh a' bhònais thar an deich bliadhna mu dheireadh. A rèir an RMT bidh àrd-mhanaidsearan agus stiùirichean fhathast a' faighinn am bònasan. Rinn CalMac tairgse-pàighidh de 1.8% gach bliadhna, thar dà bhliadhna - figear a tha stèidhichte air RPI an Lùnastail 2016. Tha an RMT den bheachd gum bu chòir dha a bhith nas àirde na sin 's iad ag ràdh gu bheil eòlaichean-ionmhais a' dèanamh dheth gun tig àrdachadh de eadar 2.6% agus 3.3% ann an ìre na h-atmhorachd ro dheireadh 2017. Thùirt Àrd-Rùnaire an RMT, Mick Cash, gun robh e "follaiseach dhan a h-uile duine" an obair a rinn an RMT san iomairt gus stad a chur air na seirbheisean aiseig bho bhith air an toirt air falbh bho ChalMac. "Chan e dòigh mhath a tha seo dèiligeadh ri buill an RMT agus cuiridh sinn na aghaidh sa h-uile dòigh as urrainn dhuinn. "Nì sin co-dhùnadh a-nis mu dè an ath-cheum a bhios againn," thuirt Mgr Cash. Thuirt Àrd-Stiùiriche ChalMac, Màrtainn Dorchetser, gun robh e na bhriseadh dùil mòr dhaibh gun robh an RMT air a dhol gu eas-aonta foirmeil. "Tha e na bhriseadh dùil dha-rìribh gu bheil an RMT air an co-dhùnadh seo a ruighinn an dèidh dhuinn a bhith ag obair cho cruaidh còmhla ri chèile airson cùmhnant ùr nan seirbheisean aiseig fhaighinn. "Tha an tairgse a tha air a' bhòrd de 1.8% an ìre mhath a dhà uimhir air na tha air a bhith air a thabhann san roinn phoblaich bho chionn ghoirid. "'S e tairgse-pàighidh fialaidh a th' ann aig àm nuair a tha buidseadan na roinne poblaiche cho teann," thuirt Mgr Dorchester. Chuir Mgr Dorchester ìmpidh air an RMT a dhol an sàs ann an tuilleadh chòmhraidhean agus aonta a ruighinn. Chaidh buill an RMT air stailc as t-samhradh an-uiridh 's iad a' sireadh ghealltanasan mu chùmhnantan-obrach agus pàigheadh mus deach seirbheisean aiseig a' chosta an iar a-mach gu tairgse.